Pastor Ben Delin was ordained and installed as the pastor of St. Paul’s on August 4, 2013. God has blessed him with his bride, Edie, their son, Gus and daughter, Gemma. He has a B.A. in Theology from Concordia University in Seward, Nebraska (2005), and a M.Div. from Concordia Seminary in St. Louis, Missouri (2013). 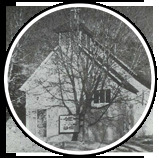 St. Paul’s was established as a Lutheran (LCMS) congregation in 1884. Faithfully this congregation has gathered through great joys and difficulties. Arsonists attempted to destroy the church in 1971, but God’s faithful people persevered through the trying times leading to its 125th anniversary and beyond. The things that we believe are expressed in what we do; whether it be in worship, Bible study or servant events we live out our theology in action. What we believe is based on what God has revealed through His Word. GATHER. There is richness to our history that we must share, but we must continue living it in our worship, celebration and fellowship events. As we come to worship our creator, redeemer, and comforter, we humbly pray that God would open our heart to the preaching of His Word so that we may repent and believe in Jesus Christ as our only Savior. GROW. We grow for many reasons, most simply because we still have much to learn. When we are willing to grow and learn, there is a culture within the church that creates purpose and opportunities to live out our faith. Bible Study, small groups and other learning events are great chances for us to learn how we can better live this life as a child of God. GO. This is how we give witness to and serve our community. Before we can teach and share our faith with the next generation they must know that we care about people. They (the next generation) can’t know unless we go to them and tell them. So we structure events and programs to service people for that purpose, because they have needs. Part of our outreach to the community is by providing food for the local food bank. They are equipped to distribute food and we help equip them to do it. Donations are gathered continually in our narthex.